We chat with the late director and star of the cult found footage thriller. We are huge fans of micro-budgeted horror movie Paranormal Farm at The Movie Waffler, and so jumped (out of our seat) at the chance to interview its writer/director/star Carl Medland a few months ago. Carl was in the midst of filming the Paranormal Farm sequel, and generously offered our writer the chance to view a rough cut of initial rushes. A few weeks later, Mr. Medland seemingly vanished. There has been much conjecture regarding the mysterious circumstances surrounding the film-maker's recent disappearance, with some quarters suggesting that the haunted farm itself had something to do with it. Upon the release of Paranormal Farm 2, it is with a mixture of sadness and pride that we now print Carl’s final interview in full. Hi Carl! I’m so glad that you seemed to have survived being killed to death and then eaten by a family of rural cannibals in the original Paranormal Farm! And yet, here you are again, visiting the doomed farm of Lucy and Darren. What’s the situation? Hi Benjamin, yes I’m certainly glad I did not end up in the lasagna. I actually don’t think I would’ve been that tasty! The device I used to bring me back to the farm to continue with my investigations was to return to the scene of the crime to make a special features documentary. 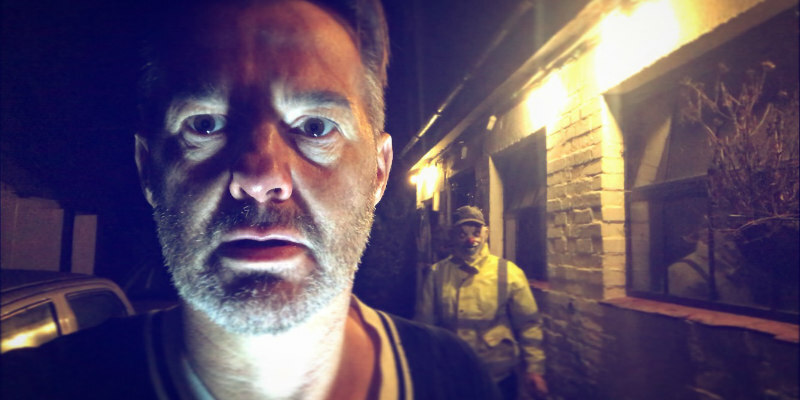 This then turns the whole matter of Paranormal Farm into a ‘film’, which then suggests that part two is in fact a real found footage film where I go back to the farm to make a proper documentary based on what inspired me to make the original Paranormal Farm. We call this film Paranormal Farm 2: Closer to the Truth because we actually find out what were my real-life inspirations in creating this film, as many of the facts are indeed true such as sightings of the beast, occult practices etc. It all becomes very meta as the viewers have to work out what was true and what was staged. Having watched a few early rushes of the film, it becomes clear that Lucy and Darren were playing along with the narrative of the first film. In this one, I get the impression that they are not as welcoming! How did you first get in touch with this fabulous couple, and has their attitude towards you changed since the release of the first Paranormal Farm? In this film you compare yourself to Mike Leigh. I definitely see that (if Mike Leigh made a film about a haunted farm, that is), but could you elaborate a little upon this comparison and perhaps talk about other influences on your film making style? Mike Leigh always begins his project process without a script. He usually starts from a basic premise or storyline which is developed through lengthy improvisation by the actors. He begins working with each actor on a 'one to one' basis. My similarity with Mike is there is no script and I have a basic premise of a storyline. The film then becomes a fusion of traits from the characters and the truth from the landscape they inhabit, for example the legacies of the farm. Lucy and Darren never feel like they are on a film set, it is in fact myself who is the visitor on their farm, which is a place more familiar to them. Also, over the course of the weekend, Darren and Lucy will just get on with the day-to-day farming duties. My process is a very sensitive process where I must approach them with nothing more than my mobile phone and just ask them questions as part of my documentary investigation. If I capture a tone in their response or a shift in the mood I will play on this in the narrative of the story and then weave in elements that would enhance the overall storytelling experience. I love how creative and accomplished your films are, especially when you consider the meagre budgets of them. What are the main challenges for micro-budget film makers? Could you also talk about the distribution of the Paranormal Farm films? Who is distributing them and how did you go about selling the films? Both Paranormal Farm films are made on a zero budget. I find this brings more creative thinking to the process as I really have a blank canvas to create an authentic experience. I believe when shooting a documentary all you need is vision and interesting subject and characters to bring this to an audience’s attention. These ingredients fused with my love of horror over the years was a marriage made in heaven. Taz Yildirimlar is both the producer and distributor for these films; through his independent distribution label he has sequentially sold these films to POV, however, who are an exclusive found footage distributor via streaming and DVD. I really like both Paranormal Farm films, but the thing is, I find it really difficult to explain exactly why. Perhaps you can help me: why should people watch the Paranormal Farm duology? Paranormal Farm is an authentic and unpredictable experience. And very British, too. I aim to create a found footage film which is both sincere and entertaining. I wanted to create something which has charm and interesting characters you can be invested in. I wanted to toy with the genre of found footage and the whole meta film experience. I did not want to create a found footage film like many of the other American films where they become predictable and you’re not invested in the characters. I want the viewer to challenge the genre itself, making them question whether they are watching true life or not. Thanks so much Carl. I wish you the very best with the new film. I will be telling all and sundry how much I loved it and how unique it is, too. Thank you for both making me laugh and for creeping me out. That’s ok Benjamin. I’m so pleased you enjoyed the films. To find out the horrific fate of Carl Medland, writer/director/good sport, watch Paranormal Farm 2, which is on streaming services now!